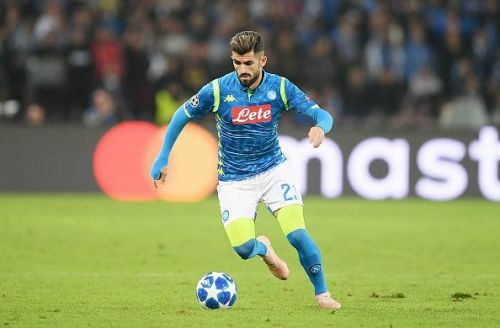 Chelsea manager Maurizio Sarri, who has already brought in Jorginho to the Stamford Bridge from his former club, is set to raid the Italian club again for right-back Elseid Hysaj, who is rated highly by him, The Sun has reported. The Italian had previously managed the Albanian defender at both of his previous clubs with the player following Sarri to Napoli from Empoli in 2015. He was a star in I Partenopei's 2015-16 campaign in which, they finished second in the Serie A only behind the Turin giants Juventus. Napoli had blocked Chelsea's approach for the player this summer, with Calciomercato reporting that the Naples based club had made a "gentleman's agreement" with the Blues to stop Sarri from signing any more of his players following the move of Jorginho to the Premier League club. Maurizio Sarri never played football professionally. He is one of the few managers to have managed a Premier Leaue club without any playing experience. Sarri is known for bringing his favorite players from former clubs into his new team. He had previously brought the duo of Hysaj and Mirko Valdifiori from Empoli to Napoli when he took over the reigns of the club from Rafael Benitez in 2015. Jorginho who is central to 'Sarri-ball', was signed by the Blues from Napoli for £57 million this summer and was reported to be a part of the deal to bring Sarri to the club. According to The Sun, Chelsea are preparing a £20million January bid for Napoli right-back Elseid Hysaj. The daily also reported that following a failed summer bid, the club are eager to resume the negotiations for the 24-year old over a potential January switch. Sarri doesn't see his fellow Italia, Davide Zappacosta as part of his plans at the club, would like to off-load the player before he brings in another defensive reinforcement and the right-back could even be offered in a swap deal for Hysaj. Hysaj was linked with Chelsea in the summer as well and a lot of other reputable and reliable websites have also linked with him with the Blues. Napoli are also reportedly looking for a replacement and all these developments have indicated that the player might be on the move very soon. Chelsea have defeated Pep Guardiola's Manchester City last weekend, meaning Liverpool are the only unbeaten team in the Premier League at the moment. With the looming threat of FFP sanctions, Chelsea might splurge huge sums of money this transfer window, Express reported. After their 10th league win this season, they head to Hungary for their UEFA Europa League fixture against Vidi this Thursday. Maurizio Sarri: Not the happily-ever-after Chelsea expected?